Kerrang Magazine: "Chris Cornell - A Life, Through The Ages And Pages Of Kerrang!" 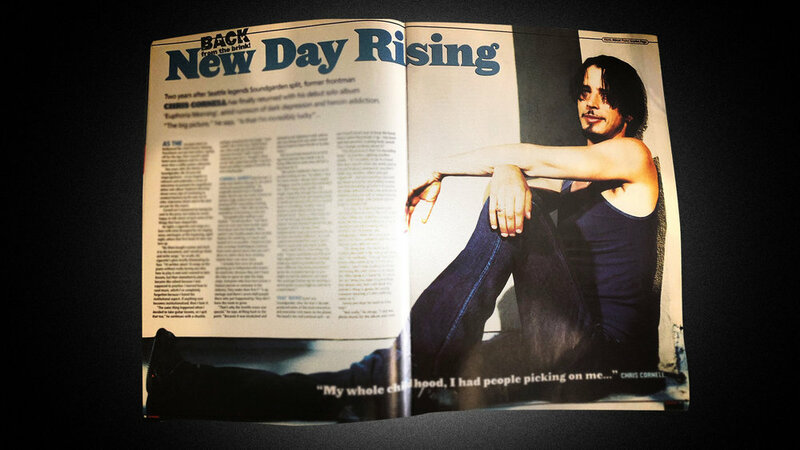 CHRIS CORNELL: A LIFE, THROUGH THE AGES AND PAGES OF KERRANG! In memory of the legendary vocalist who passed away one year ago today. About that “Soundgarden hype”… In April 1992, it had well and truly struck. When K! reconvened with the band, they were touring American arenas supporting a plucky bunch of underdogs called Guns N’ Roses. Some in the alt.rock community saw the pairing as something of a betrayal; grunge, after all, was supposed to be the antithesis of the debauched legacy of ’80s rock. “A lot of it is blown out of all proportion,” Chris told K! journalist Stefan Chirazi about life on the road with Axl Rose and co.. “With Guns, a lot of the reports about how they handle their success and what they do aren’t true.” While he played down any notion of rock excess, he did note that being called a rock god was starting to rankle. And it would continue to do so from then one. When K! travelled to America to catch up with Soundgarden on tour with Neil Young in 1993, we were greeted by a freshly shaven-headed Chris Cornell. Naturally, our cover story bore the headline: Shaved ‘N’ Dangerous. Hey, it was a different time. A new hairstyle wasn’t the only change. They had already started road-testing some brand-new songs with names like Spoonman, Kickstand and My Wave, but when it came to the title of Badmotorfinger’s follow-up they weren’t giving up the goods. “We were thinking about Three Years, Eight Days And Four Minutes In The Life Of Arrested Development,” joked Chris to Don Kaye. “Or we might just cop out and call it Soundgarden.” It was, of course, actually soon to be called Superunknown – the record which would help define a) Soundgarden to the masses b) grunge c) the ’90s d) an exemplary way of selling millions of copies without compromising e) any album collection worth its name. In 1997 Soundgarden imploded, calling it a day shortly after escalating tensions in the band came to a head with one disastrous show in Honolulu, Hawaii. But before all of this, K!’s Morat headed to Seattle in a feature that found the band in high spirits but not dysfunctional on the back of their perennially overlooked fifth album Down On The Upside (when was the last time you listened to Tighter & Tighter? Do it. Do it now). Just as our humourous photoshoot drew attention to the playful side of a band so often presented as consummate miserablists, so too did their quotes. “My friends are cool about my money. But then I did give them all motorcycles…” deadpanned Chris. “The first time I walked into the room when those guys were just jamming, it sounded incredible,” Chris Cornell told K! writer Ben Myers of the time he stumbled into seeing Rage Against The Machine men Tom Morello, Timmy C and Brad Wilk. “After some brief thought, I realised I couldn’t come up with a reason good enough not to do this band.” And so Audioslave was born. For some, pairing the howling voice of Soundgarden with the incendiary musical backbone of RATM was an idea that was simply too good to be true. No way could they live up to that kind of hype, they argued. Imagine how refreshing it was, then, that the mammoth classic rock strains of their 5K-rated self-titled debut lived up to fans’ wildest dreams. And then some. When K!’s Alexander Milas joined Chris, Tom Morello, Timmy C and Brad Wilk for our cover story in 2005, they were a band growing into their own skin. And that included the decision to finally embrace their combined heritage. After initially ignoring the wealth of material at their disposal, Audioslave had taken to covering both Soundgarden and Rage Against The Machine songs. Fans were going wild. Not only were they resurrecting the likes of Spoonman and Killing In The Name live, they were also preparing to unleash their second outing Out Of Exile, an album that saw Chris tackling the recording sober. “Getting cleaned up changed a lot for me,” said Chris. “I’m not the kind of person who wants to know or sit back and analyse things, but I’m a new man now…” Audioslave would return the following year with their final album, the perma-underrated Revelations, before disbanding shortly afterwards. Their legacy includes some of the greatest songs of the ’00s.